Split valuation refers to the valuation type on a material master. Typically, organisations will want to track material costs, for example, for new, used or repaired stock. The valuation type field on the material master allows you to track this stock separately, and specify what type of stock is being moved or purchased, and charge appropriately. There are follow-on effects, of course, in finance account assignments etc. 1. Stock from in-house production has a different valuation price than externally procured stock. 2. Stock obtained from one manufacturer is valuated at a different price than stock obtained from another manufacturer. 3. Different batch stocks of a material have different valuation prices. 4. Value damaged and repair part differently from a new part. To used split valuation, you have to activate it using 'OMW0'. In split valuation, you can distinguish between partial stocks of a material according to certain criteria and valuate them separately. The material stock is divided according to valuation category and valuation type. The valuation category determines how the partial stocks are divided, that is, according to which criteria. The valuation type describes the characteristics of the individual stocks. Your entries are only relevant if you set split valuation as active in the function "Global settings". global valuation categories via menu "Goto --> Global Categories"
global valuation types via menu "Goto --> Global Types"
2. Allocate the valuation types to the valuation categories. a) Select "Goto --> Global Categories". b) Position the cursor on a valuation category and select "Goto --> Global Categories --> Assignments --> 'Types->Category'". c) Activate the valuation types you want. 3. Determine the local valuation categories for each valuation area. a) Select "Goto --> Local definitions". b) Position the cursor on a valuation area and select "Goto --> Local Definitions --> Allocate Categoires->Org.units (button Cats->(OU)". You obtain a list of the global valuation categories. c) Activate the categories to be used in this valuation area. The system creates the local valuation types based on the allocations under point 2. Only now can you create a master record with split valuation. 1. Create a material master record, selecting the Accounting View 1. 2. Enter your data as required on the Accounting data screen, specifying a valuation category. (If you can't find the valuation category field, it might be hidden, use OMSR to define the Field Groups. Look for the field MBEW-BWTTY for Valuation category). 3. Be sure that the price control indicator is V for moving average price and enter a moving average price. 4. In the case of split valuation, you can create only one valuation header record with price control V because the individual stock values are cumulated, and this total value is written to the valuation header record. This is where the individual stocks of a material are managed cumulatively. To do this, fill in the Valuation category field on the accounting screen when you create the material master record and leave the Valuation type field blank. 5. Save your data and the system creates the valuation header record. 6. The initial screen appears. 7. Extend the material by creating new material master records from the Accounting view 1. For the first material, specify a valuation type in the Organizational Levels dialog box and enter the respective accounting data on the data screen. Proceed likewise for the other materials, distinguishing between them by valuation type. To do this, call up the material in creation mode again. Due to the fact that a valuation header record exists, the system requires you to enter a valuation type for the valuation category. 8. Repeat step seven for every valuation type planned. You want to valuate the stock of material XYZ that you obtain from manufacturer A in Los Angeles at a different price than the stock you obtain from manufacturer B in Detroit. In this case, the valuation category is H for origin. Your valuation types can be LOS ANGELES and DETROIT. If a material is subject to split valuation, every quantity (sub-stock) of this material must be assigned to a valuation type (for example, country of origin). Valuation data (for example, valuation price, total stock quantity, total stock value), which is defined for every valuation type at valuation-area level and applies to all dependent storage locations. Stock data, which, like batch data, is managed separately for each storage location. If a material that is subject to split valuation is also subject to management in batches, its stock data is not managed by valuation type, but rather by batch. Every batch is assigned to a valuation type. The stock quantity, stock value, and valuation price for all valuation types are managed cumulatively at valuation-area level. Must the Valuation Type Exist Before the First Goods Receipt? You can post the goods receipt of material of a certain valuation type only if the valuation data for this valuation type already exists, because the system valuates the goods receipt at the price defined in the valuation data. On the other hand, the stock data for the valuation type is created automatically during the first goods receipt into the storage location, if this is defined in Customizing for Inventory Management. If you want to enter goods movements for materials subject to split valuation, you must enter the valuation type in addition to the material number. Enter the valuation type in the Batch field for MB01. In MIGO, there is a valuation type field in Detail data -> Material. 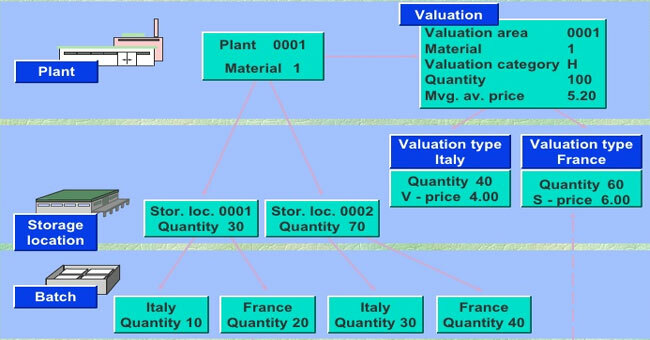 If stock quantity, stock value, and valuation price for all valuation types are managed cumulatively at valuation-area level, is it possible to report or view inventory by Valuation Category/Types for a specific material when trying to meet a customers specific needs in regards to price, quantity and batch characteristics? Very good information - have a follow up question - we have a global materials catalog in our SAP system with materials/ items extended to plants as needed - struggling with how to apply split valuation after the Material Master has been established and extended to a plant site - have tried and system will not allow due to "inventory in previous accounting period". Can you tell me how to turn split valuation on when the MM exists and is extended?